This is a street food at China Town in Burma. Some add noodles and soup on top which is equally delicious. 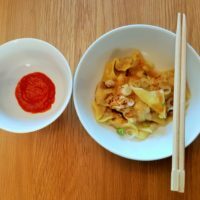 Easy to make and the wontons freeze very well. My wontons are not traditional parcel, they are triangle shape which I think is best for cooking the wontons evenly without a risk of being over cooked. Keep the frozen pastry out for 30 mins before starting this recipe. While the soup is simmering, mash ginger and garlic, coarsely chop prawns and spring onions. Mix all the ingredients for wonton in a bowl. Heat up oil for fried onions, test it with chop stick to make sure you see bubbles around the chopstick. Add Garlic and fry until slightly golden. Add a teaspoon of mixed stuffing into the middle of the pastry. Push the excess air out and seal using the water into a triangle shape, (this is the best shape as the pasty and stuffing will cook evenly). I find traditional parcel shape leave the stuffing over cooked and pastry underdone. Make sure the soup is ready and boiling. Use the dumpling sieve(bought in Morrisons) as per my video, if not cook the wontons in a frying pan with the soup for 3 mins. The pastry should be translucent. Transfer the cooked wontons to a bowl, 8 per bowl. More if you are hungry. Add a teaspoon of mixed soy sauce and sesame and a teaspoon of garlic oil. Garnish with spring onions. Best served with a hot sauce and soup.